The first day of Samvat 2072 closed on a weak note with investors resorting to profit booking from capital goods, FMCG and IT counters. Investor sentiment dampened over Fed rate hike and falling crude prices, as the markets lost over 2 per cent in this week. Mumbai: The first day of Samvat 2072 closed on a weak note with investors resorting to profit booking from capital goods, FMCG and IT counters. Investor sentiment dampened over Fed rate hike and falling crude prices, as the markets lost over 2 per cent in this week. 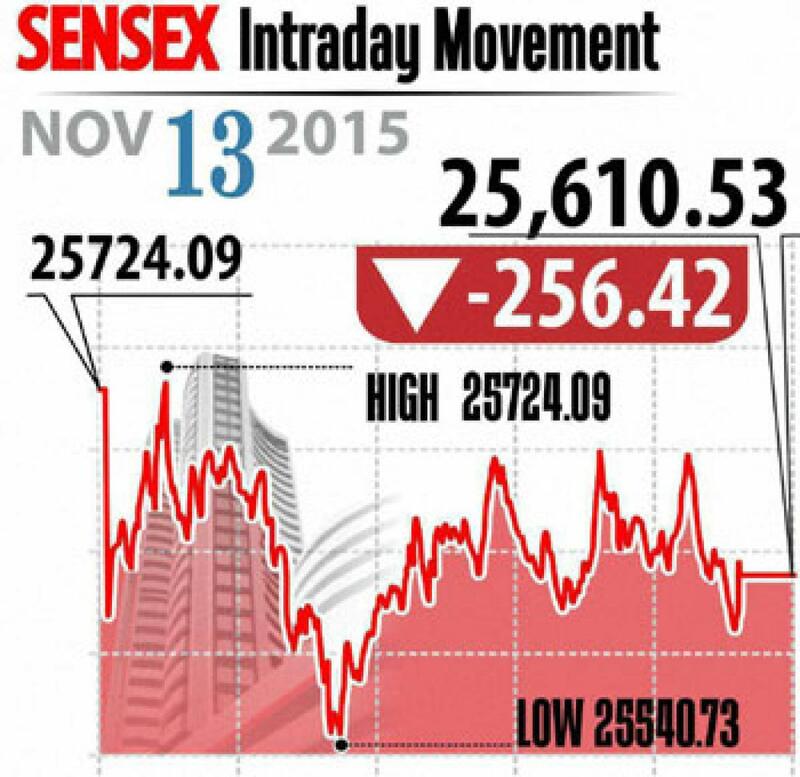 Sensex fell 256 points to close at 25,610 and Nifty ended 66 points lower at 7,762. Meanwhile the broader market also underperformed with midcap and smallcap indices fell up to 1.4 per cent each. Besides the global cues, the lower industrial output in September raised concerns over the economy, also retail inflation dashed hopes on rate cut chances in the next policy review. The markets are now focusing on the winter parliament session where host of financial legislations are to be passed and a possible rate hike by the US Fed. On the sectoral front, the FMCG and capital goods indices lowered about 2 per cent followed by other indices like healthcare, IT, auto, oil & gas and realty which fell about 1 per cent. On the rate sensitive sectors like banking, real estate and autos closed down following fall in the macroeconomic indicators, the investors have turned more cautious and looking to RBI for rate cut signal. While Vedanta, Hindalco, ONGC, TCS and L&T are the top losers, on the other hand, Coal India, Axis Bank, RIL and Airtel gained up to 3 per cent. As the government called of international bids for setting up of washery in Jharkand, Coal India shares gained about 3 per cent.